Harvests early summer, stores into spring. 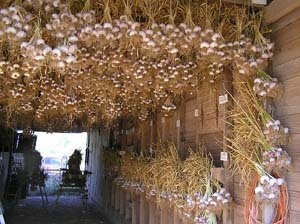 Many Americans who travel to the South of France for the cuisine fall in love with a beautiful garlic there called Rose du Lautrec and to their regret, they cannot find it when they return to the USA. Friends, we finally have some Rose de Lautrec and expect to have even more next year. Rose de Lautrec is a beautiful Creole that is almost as long storing as its fellow French Creole, Germinador but has a much more robust flavor.